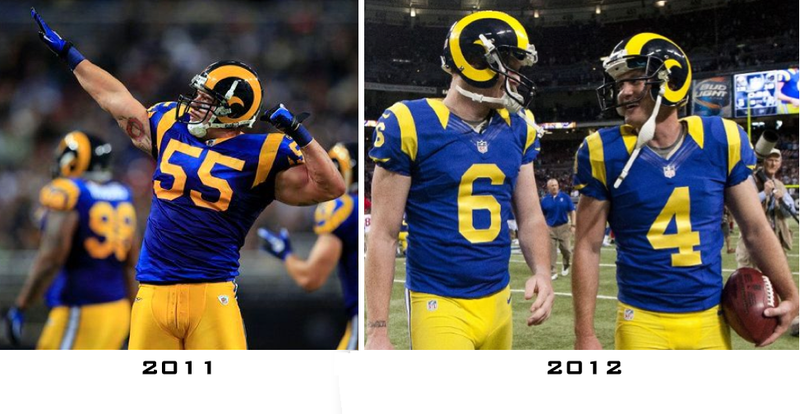 The Rams broke out their gorgeous throwbacks Sunday, but something was just a bit off. I noticed it Sunday, and it was later confirmed by UniWatch: the yellow on the Rams' uniforms is just a little bit different than when they wore the same throwback set last year. I do think last year's shade looks better, but ultimately it doesn't detract from how great the Rams look, at least in my mind. More of this, please, St. Louis. The Falcons have worn their gorgeous throwbacks on a number of occasions this year, so I really don't have to say much about them, because they still look great. I love the contrast between the two uniforms here: the almost gaudy Redskins with their gold pants side by side with the blue and gray of the Giants. My favorite part of this picture, though, might be RGIII's shoes: just solid black, thank you. This is a tough one to describe, because I don't really dislike either of these uniforms. However, the game itself just wasn't that nice took look at, probably because of all the blue. And correct me if I'm wrong, but doesn't even the turf in Detroit look a little bit blue? Maybe not in this shot, but when I see it on TV, it almost always looks blue to me. Perhaps I'm imagining it.